The current, 2016 Weatherby Orion I O/U shotgun is available in 12 gauge only, is made in Turkey by ATA, and sells in the area of $850 today in the United States. To get to the crux of the biscuit, the new Weatherby Orion is a version of the ATA Arms SP O & U shotgun, in a Weatherby box. It is generally a good-looking shotgun with a generous recoil pad that has a hard insert on the top that helps prevent snagging on clothing when mounting. The tested model has 28 inch barrels, three inch chambers, and weighs 7.5 pounds, with triggers that break in the 6-1/4 – 6-1/2 pound range. It is an entry-level, “value” type of O/U. The mechanical triggers themselves have excessive take-up and are substantially heavier than desirable in any shotgun. Yet, I have tested worse, a whole lot worse, and comments about this gun have to be tethered to its low price point. The buttstock has a very nice Prince of Wales type pistol grip. The forearm is a bit large and pregnant-looking, but feels good in the hand. UPS was not kind to my test gun, for although there was no external damage to the box, the forearm took a good whack somewhere along the route, and is well dinged-up on the left side and also has a crack in it where it meets the action. This is not Weatherby's fault at all, but these things happen. 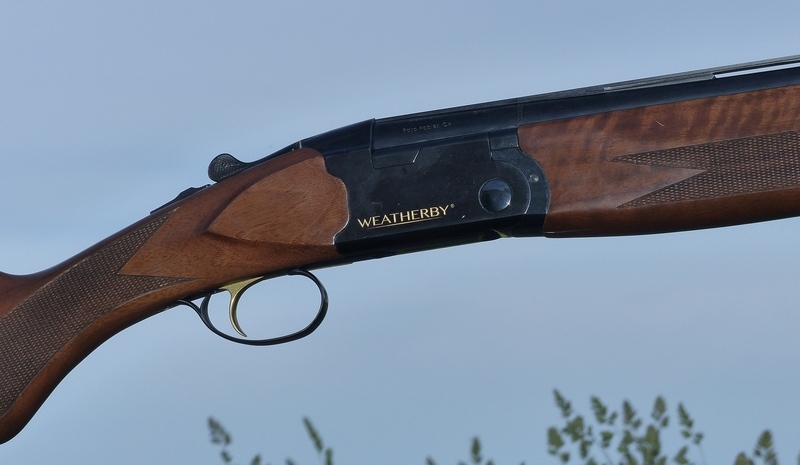 The action of the Weatherby Orion is essentially the Beretta 686. The forearm is redesigned in a plump way and the barrel set seems a bit heavy. The Weatherby Orion I has standard Invector style choke tubes (Winchoke), and four are supplied. One thing that actually is better than the Beretta 686 is the safety, which offers a far better raised profile and gives better purchase. It is a bit stiff, but it is what you might call the “Browning style” H-gated left / right tang safety. The safety, thankfully, does not re-set as you break open the action. As you can probably tell from my tone, it is really hard for me to get wildly enthusiastic about entry-level O/U shotguns. Nevertheless, there is a large market for them, and at $1099 retail and $850 street, you'll be hard-pressed to do better for the dollar. ATA is the best of the economy Turkish makers, and Weatherby has a very good track record of standing behind their product, even if it sometimes is not as breathtakingly fast as some folks would like. Sure, I believe that a Beretta 686 Silver Pigeon I models are far more desirable shotguns, but you are looking at the $2000 area not $850. So, within the envelope of price-point product, yes, I think most folks will be satisfied with this shotgun if $850 is what they are willing to pay for a an O/U. It is be no means a breathtakingly brilliant shotgun, but at its very low price-point it is a lot of shotgun in 2016. It is better than can be rationally expected in its class and that means that although it is this very class of shotgun that is uninspiring, the Weatherby Orion I is good bang for its comparatively few bucks.